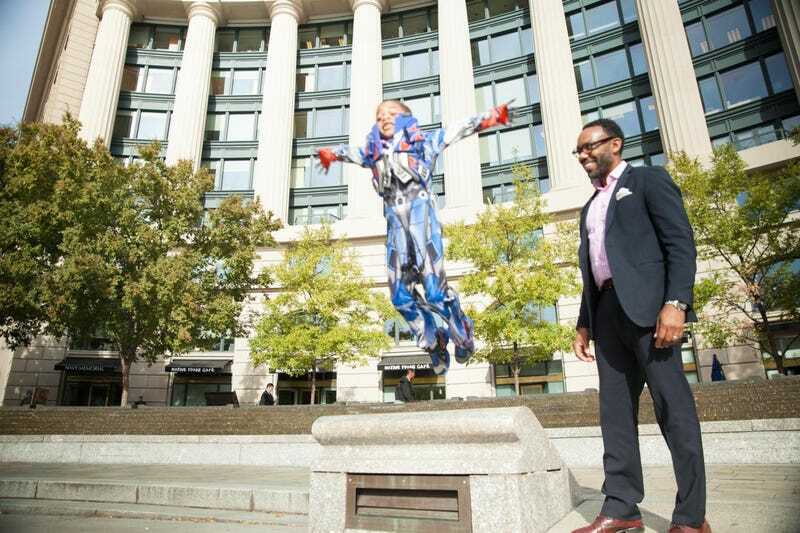 Andre Perry and son Robeson at the U.S Navy Memorial in Washington, D.C. “I need for Roby to fly around the world like a superhero,” says Perry. I almost named my son “August.” I grew up in Pittsburgh, hometown of acclaimed playwright August Wilson and the primary set of his Pittsburgh Cycle, a series of 10 plays that document the African-American experience throughout the 20th century. I didn’t grow up knowing my father; he was killed in jail. But I recognized Troy in other Pittsburgh fathers. The scene reminds us of what fathering is supposed to be. He provides. He pays bills and takes out the trash. And a good black father is supposed to prepare his son for a hard, cold world of racist white bosses and mean teachers. Black fathers are to prep their sons for the beatings they’ll get later at the hands of neighborhood watchmen and crooked cops. We’re supposed to teach our sons how to respect authority by instilling fear in the relationship. To be a good father, you have to control your son. And that starts with tattooing your name on him. Wilson knew that black men’s relationship to white masculinity made fatherhood loveless. You don’t have to love your son in order to live up to your responsibilities as a father. But as soon as my youngest son was born, I knew that he deserved love. Even more, I wanted him to be free, so I named him Robeson—after Paul. As a father of two sons (I married into fatherhood), I’ve learned that loving my sons means that I have to reject the legacy of masculinity and what fatherhood is supposed to be. Men don’t really know how to love because we’re too busy trying to control a world we don’t own. When scholar and writer bell hooks taught me how my pursuit of white masculinity was the only love I really knew, I began new searches for love. I definitely found it with my sons. Every interaction with my sons is an exploration in learning how to love. I never said “I love you” comfortably until my sons taught me how. I’m learning how to hold Robeson, not to control him but to convey affection and attention. I try my best to teach without the consequence of punishment. He should have the privilege of learning without bounds. I seek to gain my sons’ respect without leveraging fear. Being afraid doesn’t get you very far in life, and I need for Roby to fly around the world like a superhero. I do my best to replace preaching with listening, so I’m trading shouts with penetrating questions. And I try to model these skills with the people closest to him. Boys learn how to shame women from other men trying to be good fathers. Yes, I have to prepare my black boys for a world that is harsher to black folk. However, I need my children to recognize my efforts to make the world see their glorious smiles. I don’t have to harden my children any more than the world invariably will. There will be racist teachers, bad cops, ugly employers and mean peers. I refuse to have my sons adapt to broken systems. Preparing my sons for that reality means that I model and teach how to get justice for them. My sons have to see my capacity to love. That means they’ll see a righteous indignation that emanates from loving them and other black people. I didn’t have a personal model for this kind of fathering. I honestly don’t know if I’m a good one. I just know that I have to unlearn fatherhood so that I can instill in my sons the kind of love that will make them free.